May 6, 2015, 7:00, downtown at Suzie’s Dogs & Drafts, 32 Phelps St. Fr ee parking behind Suzie’s and in the lot behind the Voinovich Building, corner of Hazel and Commerce. 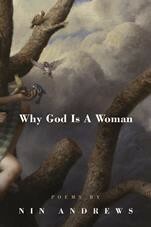 Why God is a Woman is Nin Andrews’s sixth book of poetry. Her poetry, interviews and essays have been published in numerous journals and anthologies, and she is the recipient of two Individual Excellence Awards from the Ohio Arts Council. She is the mother of two grown children, and she lives in Poland, Ohio, with her husband, a physics professor and bass player, and her two Boston terriers, Sadie and Froda. Open mic to follow, moderated by Sophia Buggs of Lady Buggs Farm. This entry was posted in Uncategorized on April 19, 2015 by lityoungstown.